Barcelona is a sprawling city of 1.6 million people. Most attractions are concentrated in 3 areas: the Old Town, Montjuic and at the waterfront. A few attractions are located outside these areas but should not be missed. To help you spend your time wisely, we have organized the Barcelona City Guide geographically. Top attractions in Barcelona's Old Town include the Barcelona Cathedral, Las Ramblas, Placa de Catalunya and the Columbus Monument. 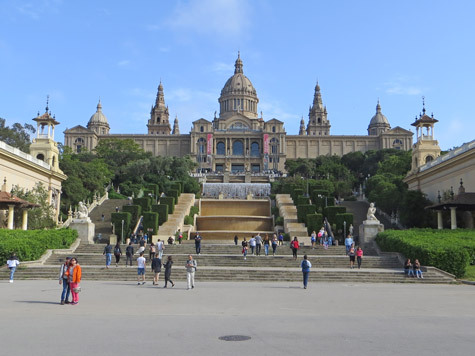 The Montjuic District is home to world-famous landmarks including the Magic Fountain, the National Art Museum, Placa d'Espanya and Olympic Stadium. Popular attractions in Barcelona's Waterfront District include beautiful beaches, the aquarium, Maritime Museum and picturesque Port Vell. Places of interest outside the 3 main districts include Gaudi's Sagrada Familia, Casa Mila and Camp Nou - home to Barcelona's football club. This section focuses on the Barcelona airport, train stations, metro system, funiculars, trams, cruise ship terminal and public transit. A broad selection of quality hotels can be found in the Barcelona city centre, near the El Prat Airport and in outlying areas.